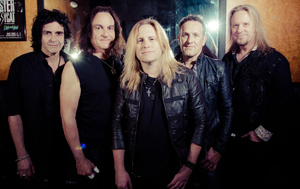 LAST IN LINE---the band that features current DEF LEPPARD/former DIO guitarist Vivian Campbell, former DIO/BLACK SABBATH drummer Vinny Appice and vocalist Andrew Freeman (RAIDING THE ROCK VAULT/OFFSPRING) have confirmed six USA concert dates for October before they head out on a UK/Europe tour. After memorable appearances at the LOUD PARK Festival in Japan and Rocklahoma in the USA, requests came soaring in from fans, demanding that LAST IN LINE play more stateside shows. To round out the line-up, bassist Phil Soussan (OZZY OSBOURNE, VINCE NEIL) has been enlisted after original DIO bassist/original LAST IN LINE member Jimmy Bain passed away. Erik Norlander (Ex-ASIA) will handle keyboards. Vivian Campbell says, "We're thrilled and humbled by the reaction the Heavy Crown album has gotten and in due course we look forward to playing more shows across the entire U.S. as schedule and resources permit." Earlier this year, saw the release of the well-received, debut album from LAST IN LINE, Heavy Crown. The album landed at #1 on the Billboard Heatseeker Chart, #6 on the Hard Rock albums chart and #22 on the Top Rock chart. What started as a casual and fun reunion jam in a Los Angeles rehearsal room in 2011 has grown into a fully-fledged recording project that has taken on a life of its own. LAST IN LINE, the band, takes its name from the second DIO album released in 1984. Vinny Appice, Jimmy Bain and Vivian Campbell were Ronnie Dio’s co-conspirators and co-writers on the Holy Diver, Last In Line and Sacred Heart albums – records that defined the classic early DIO sound and became a part of rock history. VIP Packages can be purchased at the band’s official website. They include: Meet and Greet with LAST IN LINE, VIP Souvenir Laminate, Guitar Pic Set, Group Picture with the band, Personal items autographed and Autographed Band Photo.